Dry eye syndrome is a multifactorial disease of the tears and ocular surface that results in symptoms of discomfort, visual disturbance, and tear film instability with potential damage to the ocular surface as defined by the International Dry Eye Work (DEWS) in 2007. In short, it occurs when the eyes don’t make enough tears or the tears evaporate too quickly leading to the feeling of dryness, redness and irritation. It is usually accompanied by increased osmolarity of the tear film and inflammation of the ocular surface. Dry eye has affected the broad mass and it’s no longer just a problem among elderly. Gradually, our lifestyle had changed as digital products started to dominate our daily life. We can no longer work without our laptop and communicate without the smartphone! Consequently, we’re not blinking as often as we constantly looking at the screens. This has led to a decrease in blinking rate and increase in tear film evaporation causing discomfort and likely progression of dry eye syndrome. HOW TO TEST FOR DRY EYE? In Eyeplus Optometrist, we use all of the available means of diagnosis. A series of questions including symptoms, contact lens wear history and artificial tear use will be asked to better understand the problem faced, lifestyle changed and severity of the disease. In addition, the patient is required to complete a SPEED questionnaire, which typically takes less than a minute. We look for abnormal signs like frothing near the lower lid margin, capped meibomian glands and toothpaste-like secretion. Besides that, we will also check for tear break up time (TBUT) by using fluorescein dye to evaluate one's tear film stability. This instrument shows Automated Tear Film Surface Quality Breakup Time (TFSQ-BUT) which is an important clinical marker for dry eye disease. It had 82% sensitivity and 94% specificity for diagnosing dry eye. 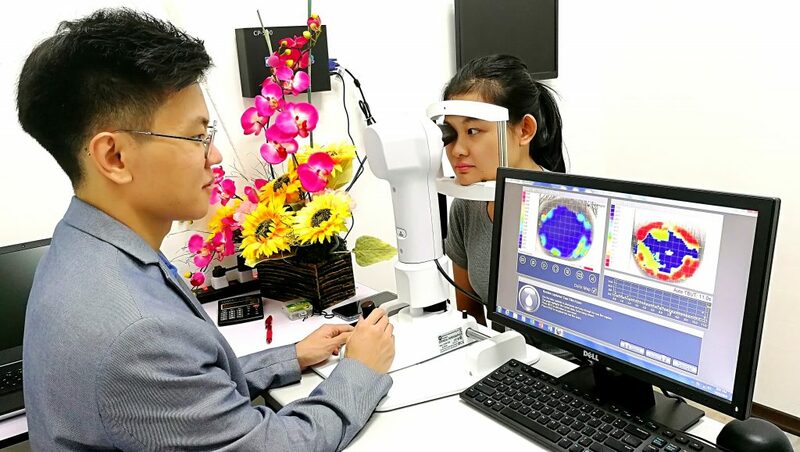 At Eyeplus Optometrist, we pride ourselves in the fact that we possess a wide range of diagnostic machines to make sure that we deliver the highest standard of eye care services in this industry. For more information on eye health and eye conditions or to find your local Eyeplus optometrist, click here.